As far as sandals are concerned, this summer might have the most diverse (and even divisive) array of trends we’ve ever seen. One one hand, you have shower slides and sporty looks holding it down for the tomboys and athleisure-lovers, while lace-up styles and block heels feel much more feminine and dressy. If you ask us though, there’s no reason we can’t dip our toes in both pools, so to speak. After all, you’d be hard-pressed to find a woman who could live all summer in just one pair of sandals. The pair you wear to the beach might not be right for brunch, and the ones you keep spiffed up for work aren’t always right for a picnic in the park. Not to mention, as modern and multi-dimensional people, the way we want to appear to the world can shift from day to day, allowing us to play an adult version of dress up. 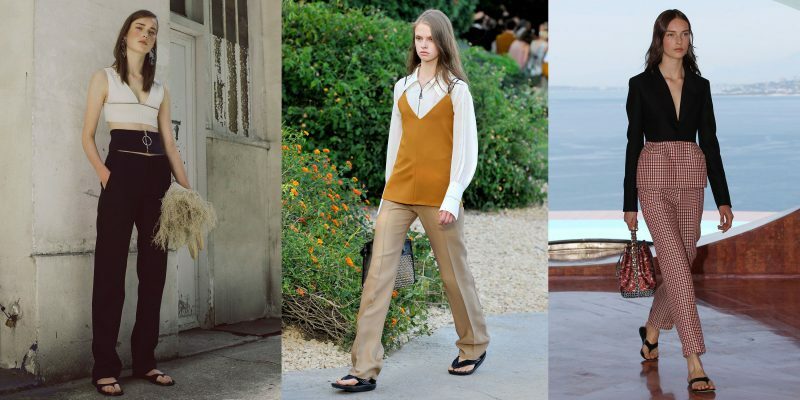 For whoever you want to be this summer and whatever adventures you might have on your calendar, we’ve rounded up the best, coolest, freshest, and most exciting sandal trends of the season, and selected our favorite pairs. Strappy sandals: printed fabric bows or leather straps hold close to the feet and fasten elegantly at the ankle. Perfect for a summer night, to add a special twist to a minimal look. Stiletto heels: A go-to weapon of seduction, especially with strappy styles. Try a single-hued design or dare with tropical colors. Wedge espadrilles: comfy, with a gypsy-style allure, it’s the summer take on classic 70s wedges. 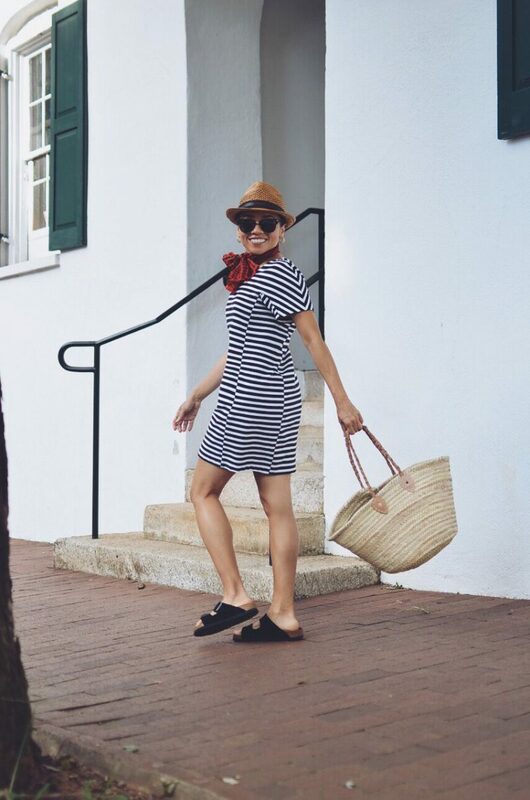 Birkenstock Sandals: they (definitely) do not elongate the figure but we must admit they are truly comfy. Ideal for summer traveling. Slippers: leather or fabrics slippers are making a comeback, from flats to 2-inch heels. They have a more tapered silhouette with respect to dad sandals and are great to top off a Parisienne-style ensemble. Comfy, colored, embellished with embroidery or crystals, you will want to collect them all. 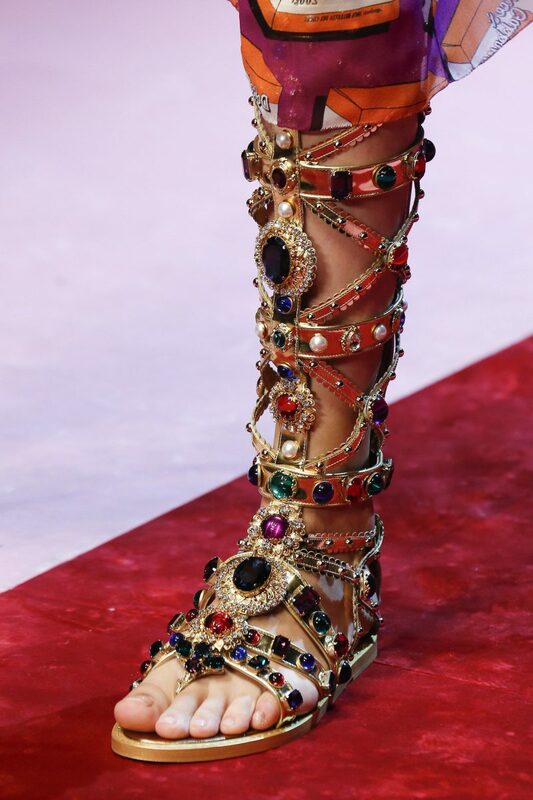 Bejeweled sandals: from silver leather to precious embellishments, every woman should own a pair to add some sparkle to a low-key ensemble. Clear sandals: much loved by Kim Kardashian, plexiglass heels or PVC details, to expose the feet: the go-to sandals for summer. Go grab them if you’re a true fashionista! Thong sandals: from ultra-flat capri sandals to kitten heels, see all the creative and precious solutions that cater for all styles and tastes. High heeled sandals: if you love heels, you’re lucky: this is the right season to show your best high heeled sandals! Stiletto remains a classic, but the latest trends see the square heels making a come back. They’re the best compromise between style and comfort! Flat sandals: if high heeled sandals are not your cup of tea, you can always count on your favorite flat sandals. Which are the trends of the season? Glitter, bows, fringes, and ribbons.